Kathmandu is the capital of Nepal, and probably one of the most sacred places on our planet. Nestled in the foothills of the Himalayas, Kathmandu is located in the eponymous valley of this great mountain range, at over 1350 meters altitude. Another two Nepali villages are located in Kathmandu - Patan, which is the largest village in Nepal, at a distance of 5 km to the southeast and Bhaktapur, which is 14 km east of the Nepalese capital. With a population of about one million people, Kathmandu is the only larger and relatively modern city in Nepal. Highly developed in the Nepalese capital are different crafts such as carving art, embroidery, leather, and tourism development. Thousands of people from around the world come to Kathmandu to touch the peaceful and animated atmosphere in this mountain town. There are four mountains that surround Kathmandu - Shivapuri, Phulchowki, Nagarjun and Chandragiri. 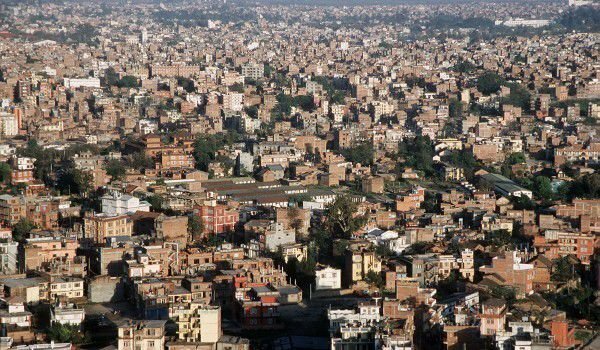 Kathmandu is divided into three main areas. Kathmandu also has an airport. The ancient history of Katmandu has managed to preserve harmony and beauty of this city. According to many Kathmandu is one of the most beautiful cities on earth. The town's history begins somewhere around 724. Back then, the name of the village was Kantipur, which translated sounds like "City of Beauty". Data on occupation of the valley by locals dates from around the third century BC. Local people believe that enormous deities are living in their valley. They tell an interesting story about the emergence of the city, because of the Buddhist monk who defeated the evil spirits and cut off the top of the hill. Thanks to his courage, the valley filled with water, which in turn formed a lake. After the swelling of the lake waters, the valley became fit for life and people settled here. The current name comes from the Kathmandu monastery, which the Nepalese capital was named after. Temple Kaasthmandap whose name literally translates as "shelter under a tree", was built in 1596 by King Laxmi Narsingh Malla and is known as Maru Sthal. This monastery was built entirely of wood and the wood according to legend, came from a single tree. Absolutely all the buildings in Kathmandu are listed as UNESCO World Heritage Sites, under the name "Kathmandu Valley." Svayambhu Hill is the highest point in Kathmandu. In fair weather, the top of the hill offers a magnificent view of the entire Valley of the Nepalese capital. Kathmandu, however, has a serious problem of air pollution. One of the largest sacred temples in Kathmandu is Svayambhunath. This temple has 350 steep steps that lead to the essence of holiness - a large white tope, which is more than 2000 years old. From the hippie wave of the 60s and 70s of past century remains the temple name "Temple of the Apes". In those years hippies turned this place into something like their home base. The Thamel area in Kathmandu is the most authentic and as such attracts the most tourists. Here you can see the settings where the legendary Beatles, Yoko Ono, Bob Dylan and others have stayed.